Beautiful beaches (5 km), intimate bays, clear sea and the rest of the interior of Istria; these are just a few ingredients of a stay in this beautiful apartment, 5 km west of Rakalj. This apartment (first floor) has an identical, fresh and clean establishment. You have access to wifi! 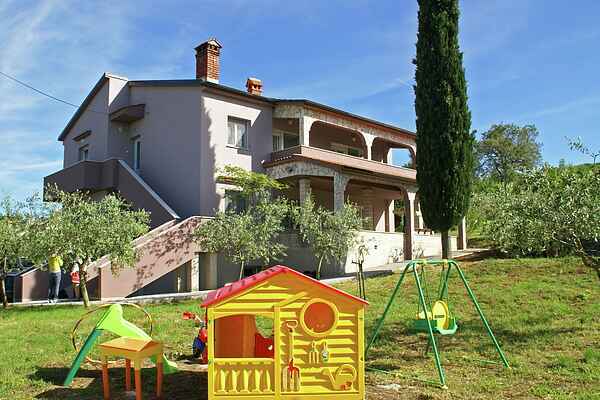 The spacious, shared garden, children can play nice. For the kids there several outdoor toys. Self enjoying the sun on one of the sunbeds. With the stone barbecue you can "evening the day culinary close! The surroundings of Rakalj is rich in flora and fauna and invites you to make walking and cycling. Are you a lover of pretty towns, terraces and some culture sniff Then there are plenty of Pula (28 km) is certainly worthwhile;! Here you can enjoy the Roman atmosphere Specifically, the imposing amphitheater, still intact and one of the largest in the world, reminiscent of times long gone. .Other advisories for a great day out the historic Rovinj (44 km), the beautifully situated Motovun (44 km) and Porec (65 km) with the beautiful Byzantine Euphrasian Basilica.